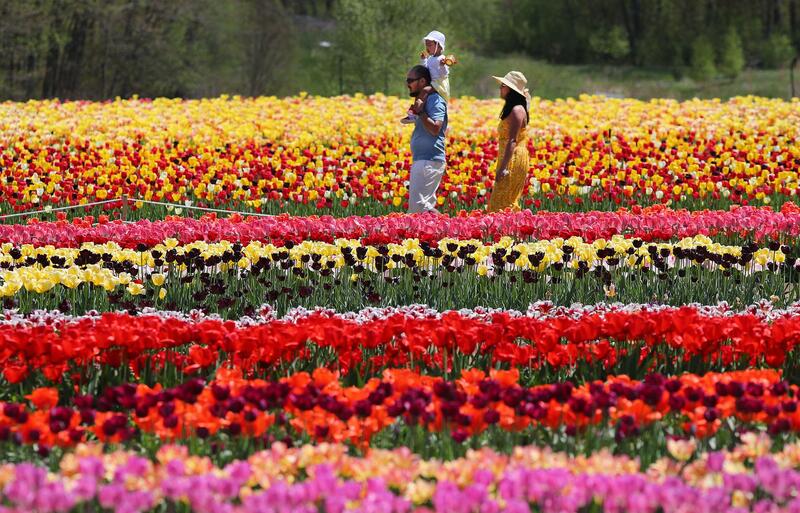 People walked through the tulips at Wicked Tulips Flower Farm in Johnston, R.I., on Wednesday. In a small town in Holland called Zwaagdijk, Jeroen Koeman’s last name is synonymous with flowers. 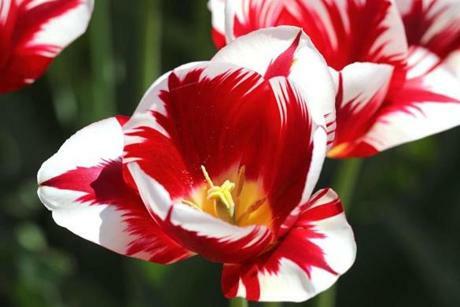 Koeman’s father is a tulip farmer, as are his older brothers. So try as he might to leave the family business, the 36-year-old found his way back to the flowers. 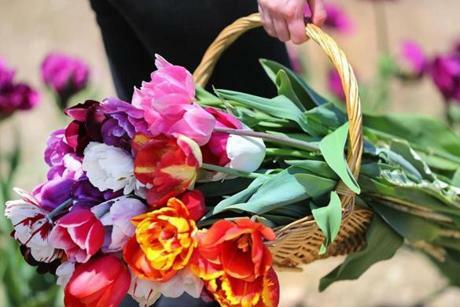 Since 2015, on a small plot in the town of Johnston, R.I., the Dutch farmer has grown acres of tulips in rows of deep purples, oranges, and sunset reds. Here, in the town that contains Rhode Island’s only landfill, Koeman founded Wicked Tulip Flower Farm with his wife, Keriann, 43, who is originally from Plymouth. Koeman’s family helped the couple launch the farm, assisting them in buying bulbs, a tractor from Holland, and planting machines. Vonshika Adapa, 5, of Shrewsbury, got all dressed up to walk through the tulips. Koeman leases and tills the state-owned soil on the edges of Snake Den State Park, alongside other farmers like himself. The project, called Snake Den Farm, resulted from a partnership between the state and the nonprofit Northern Rhode Island Conservation District to return the land to agricultural production. Turns out, the climate in Rhode Island happens to be perfect for tulips. The Koemans work year-round to prepare for one “U-pick” event in the spring that lasts for a month — if they’re lucky. In the fall, they ship bulbs nationwide to mail-order customers. 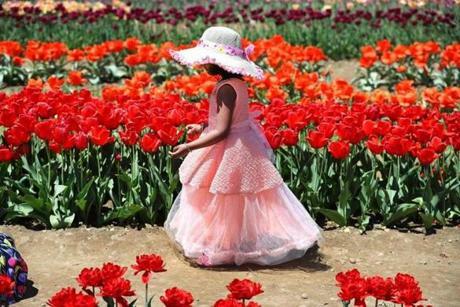 Visitors to the flower farm can now walk amid 600,000 blooms on five acres. A nearby pond and an old barn make the scene even more picturesque. Tabitha Cabral-Elliot, 10, of Westport, Mass., was framed through deep purple Queen of the Night tulips. They’ve held yoga classes in the tulips fields and early morning tours. “I’m the most proud of the fact that I created a business where as a farmer I can make people happy,” Koeman said. 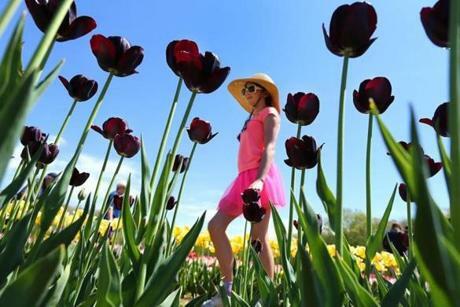 Their first year brought out close to 20,000 people all eager to tiptoe through the tulips. The second year brought close to 40,000. They’re already sold out through Mother’s Day this year. Koeman expects the U-pick event at the farm to be open for just one more week — until May 18 as a result of the late spring. Customers can check their website and Facebook profile for daily “Bloom Report” on the status of the farm’s flowers and ticket sales. On a recent Saturday morning, people walked and talked and picked their favorite flowers. Children chased one another, holding buckets and baskets of blooms. Families took pictures in their Sunday best and enjoyed picnics on a temperate spring morning before wrapping up their flowers in paper and taking them home. The Koemans call themselves a “blooming husband and wife team.” And with the addition of their son, 12-week-old Kees, life is blooming indeed. 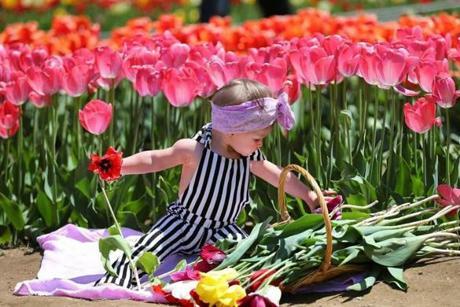 Lilly McAloon, 10 months, of Seeking, played with a basket of tulips. 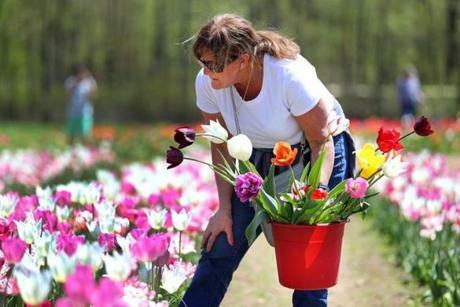 Paula Asci of Grafton looked at tulips to pick. 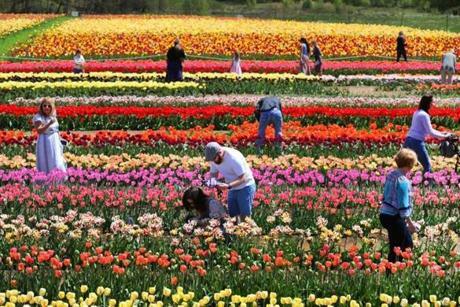 Thousands of people have tickets to pick tulips at $1 a stem and to take photographs of the 110 varieties.